The brush tool is one of the most useful tools in Photoshop, with an excellent range of features available. It has a very comprehensive options bar and a lot of options,this being the reason why you may feel a little bit lost when you use it. But don't worry. One after another. 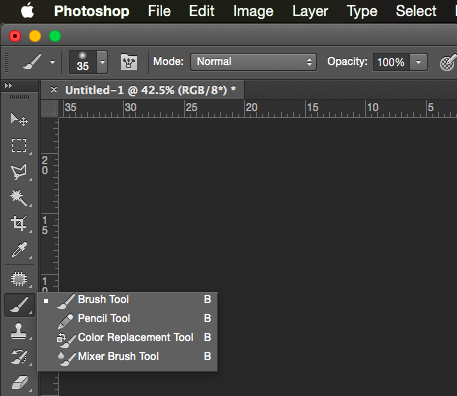 The brush tool may be selected by pressing the "B" key or by clicking the brush tool icon from the tools sidebar. Hardness, used for increasing and decreasing the hardness of the brush, making it softer or harder. Mode sets the painting mode in which the brush will be used. Opacity sets the opacity of the brush. Flow sets the flow rate of the tool. And if it wasn`t enough, the brush tool has some more options, other than those explained till now and more let's say "professional" than them. Controlling and managing those options gives you the possibility to become a great digital artist.